Manager Gary Mills has said Gateshead will not allow the excitement of a Wembley trip to derail their push for a return to the Football League. Gateshead face Cambridge under the arch in the Conference Premier play-off final on 18 May, 54 years after they were voted out of the League. "We've got to Wembley, but that's not the end," Mills told BBC Newcastle. Mills won that same final one of two visits to the stadium with the club that season. 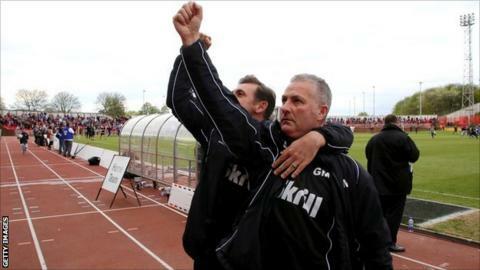 When Mills arrived Gateshead were 19th with four points from six games. The Tynesiders have now gone 14 games without defeat and won nine of them. Their third placed finish is the best since dropping out of the league in 1960. "We're going there to win, we can't get carried away with the occasion because I have seen that before with teams," he said. "It's important how we focus over the next two weeks and that I get it right on how we prepare and that we go there to win the game of football." The second-leg win against Grimsby came in front of a crowd of 8,144 at the International Stadium, a club record attendance for competitive matches. While the ground's capacity is 11,800, the majority of crowds have hovered around the 1,000 mark, although the run to the play-offs has seen gates gradually increasing - with 2,916 attending the final regular season encounter against Cambridge last month. In turn the atmosphere has been difficult to generate during the first half of the campaign, with the long-term plan to move into a purpose-built home on Prince Consort Road yet to be realised. "We don't need to move from here if we get crowds," Mills continued. "That's the only thing missing here, the atmosphere, the view you get, it's proved today. I want to get this club in the Football League and get crowds. The pitch is superb."